African leaders, civil society and youth groups today mark Africa Environment Day, which seeks to accelerate action on the numerous pressing environmental challenges facing the continent. Maseru, in the Kingdom of Lesotho, is the regional host of the 12th annual celebration, which is focused on the theme Combating Desertification in Africa: Enhancing Agricultural Productivity and Food Security. In the Kenyan capital Nairobi, over 200 young people and high-level experts will convene to review key environmental issues impacting Africa, including illegal wildlife crime, forest conservation and food security. The event—which dovetails with Wangari Maathai Day, a celebration of the life and work of the Green Belt Movement founder—is organized by the United Nations Environment Programme (UNEP), the Government of Kenya and the Green Belt Movement. Professor Maathai was Africa’s first female Nobel laureate, a champion of grassroots environmental activism and a fervent defender of biodiversity. She was also the inspiration for the Billion Tree Campaign, which UNEP began in 2006. Eight years later, 13.8 billion trees have been planted under the campaign, which is now run by the Plant for the Planet Foundation. The focus of Africa Environment Day echoes the theme of the January 2014 African Union Summit, and demonstrates a coordinated effort on the part of African leaders to emphasize the detrimental effects of land degradation to Africa’s food security aspirations. 2014 is the Year of Agriculture and Food Security in Africa. Africa is currently undergoing strong economic growth. The World Bank’s Africa Pulse projects that economic growth in Sub-Saharan Africa is likely to reach more than 5 per cent on average in 2013-2015 as a result of high commodity prices worldwide and strong consumer spending. However, the continent still must overcome challenges related to climate change, desertification and land degradation, loss of biodiversity to the illegal trade in wildlife and timber, management of waste and chemicals, and marine pollution. One of the most pressing challenges is ensuring food security. The UN Population Division estimates that Africa’s population will reach 2.4 billion by 2050, and to feed this population the ecosystems the prop up agriculture will have to be kept healthy. Yet statistics from the International Fund for Agricultural Development show that Africa has lost 65 per cent of its agricultural land since 1950 due to land degradation. According to the UN Convention to Combat Desertification (UNCCD), 4 to 12 per cent of agricultural Gross Domestic Product in Africa is lost due to deteriorating environmental condition and 135 million people are at risk of having to move from their land due to desertification by 2020. There have been some improvements in food security. The FAO State of Food Insecurity in the World Report notes that while sub-Saharan Africa has the highest level of undernourishment, there has been some improvement over the last two decades, with the prevalence of undernourishment declining from 32.7 per cent to 24.8 per cent. However, climate change can undermine these gains without firm and rapid action. 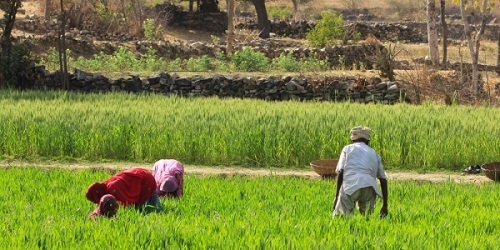 While pan-African programmes such as the Comprehensive Africa Agriculture Development Programme (CAADP) and the Sahel Green Wall Initiative are examples of concerted efforts to stem the tide of land degradation, Africa Environment Day aims to prompt a move to a more sustainable pathway, taking into consideration the post-2015 sustainable development agenda and Africa’s transformational Agenda 2063. In this respect, African leaders are recommending that land degradation, desertification and drought be placed at the centre of the debate on the post-2015 development agenda and be recognized as one the sustainable development goals. UNEP is already working with the UN Convention to Combat Desertification (UNCCD) and the Food and Agriculture Organization of the United Nations (FAO) to enhance cooperation in controlling land degradation and the resultant desertification in Africa. Ecosystem-based approaches as part of a wider transition to a Green Economy can also assist in providing food security, and late last year the first African Food Security and Adaptation conference backed these tools. The conference—including representatives from the UN Food and Agriculture Organization, regional economic communities, non-governmental organizations, the private sector and others—adopted a declaration calling for ecosystem-based approaches to be funded and scaled up by governments and development partners in order to build resilient food systems and adaptation to climate change in Africa. Wealth accounting and the valuation of ecosystem services are expected to be critical to Africa’s future growth: in low-income countries, natural capital makes up around 36 per cent of total wealth, according to recent World Bank estimates. The Mau Forest complex in Kenya, for example, provides goods and services worth US$1.5 billion (UNEP Mau Report) a year through water for hydroelectricity, agriculture, tourism and urban and industrial use, as well as erosion control and carbon sequestration. Alternative accounting has helped spur the government of Kenya to invest in rehabilitating the area and its vital ecological services. Taking the value of ecosystem services into account in national planning is a vital part of the Green Economy transition, which will slow down degradation, assist nations and communities to adapt to those changes that are inevitable, and ensure a healthy, wealthy and sustainable continent.